Congratulations to our postgraduate member Naoko Inoue who has passed the examination for her PhD titled ‘The experiences of native English speaking academics who work and live in Japan’. 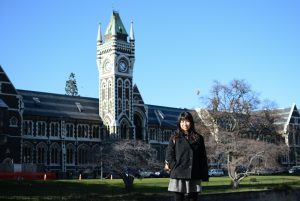 Naoko situated her study in relation to internationalisation policy in Japanese higher education. Data were collected through interviews with native English speaking academics, and discourse analysis of official (government and institutional) internationalisation documents. The study revealed how internationalisation discourses in Japan value native English speakers’ English language skills, ‘nativeness’ and, in some cases, whiteness. These discourses were both reflected and contested in native English speaking academics’ accounts of living and working in Japan. Participants recognised that they benefited from a ‘native English speaker’ identity, but they also sought to identify themselves otherwise – as ‘competent academics’ rather than ‘native English speakers’. 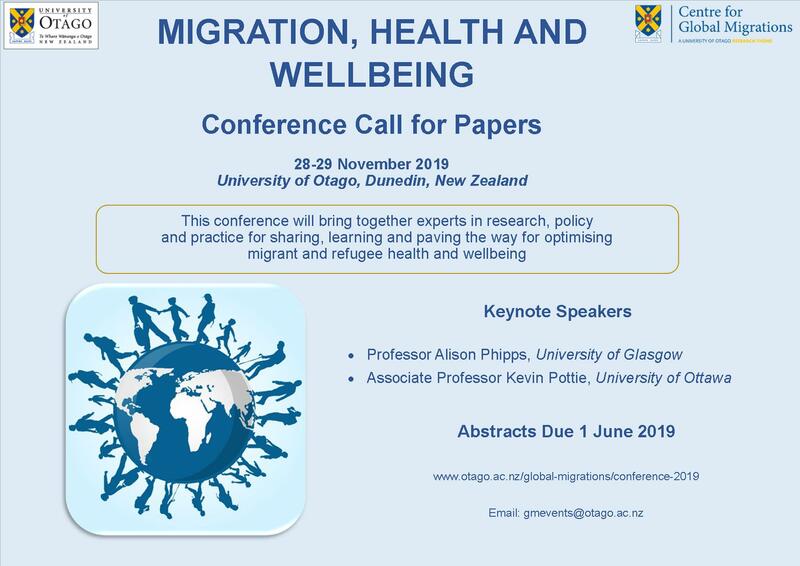 This two-day conference aims to bring together experts in research, policy and practice for sharing, learning and paving the way for optimising migrant health and wellbeing. The conference will adhere to a social determinants of health framework which acknowledges the multifaceted factors influencing the health and wellbeing of migrants in their host countries. 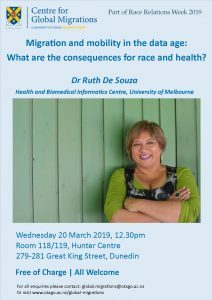 We welcome presentations that consider any aspect of migration, health and wellbeing across time and space. All submissions are welcome, including from post-graduate students. Regrettably, we are unable to provide funding support for participants. We are delighted to announce that our 2019/2020 Visiting Scholar will be Professor Maria Reinaruth D. Carlos, Professor of Economics in the Faculty of International Studies, Ryukoku University, Kyoto, Japan. 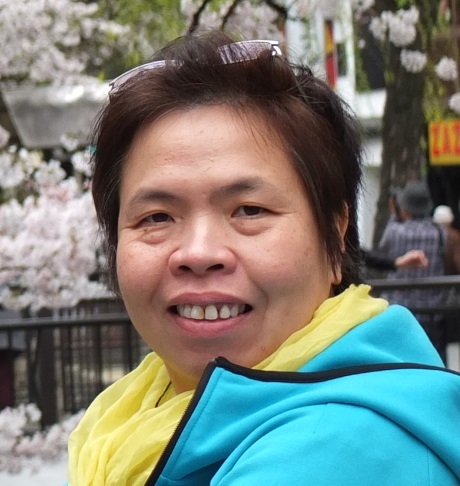 Professor Carlos will work with our member Dr Arlene Ozanne to advance their research on overseas-educated nurses working in the elderly care sector in New Zealand and Japan. 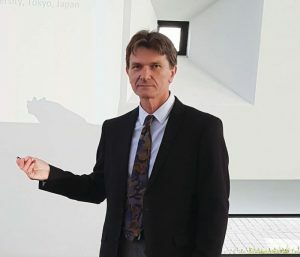 Part of their research will offer policy ideas to Japan, the world’s most aged country, in its search for long-term solutions to this problem. 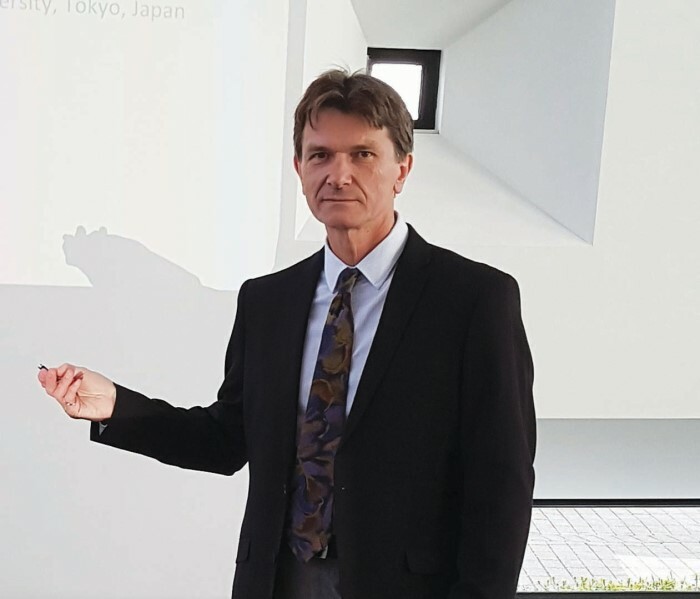 During her visit to Dunedin in early 2020, Professor Carlos will give a public lecture examining the links between skills and labour migration patterns and a workshop on overseas-educated nurses in New Zealand’s elderly care sector. Information technologies gather and process data on almost every human activity at unprecedented speed and volume, with potential for both timely and novel insights into complex social issues. At the same time, there is growing evidence of inequalities across applications of big data with discriminatory impacts. 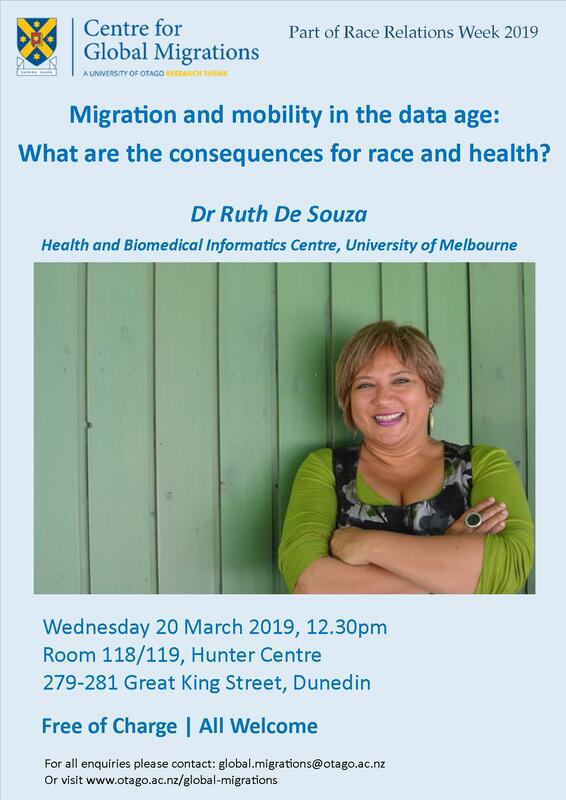 In this public lecture during Race Relations Week 2019, Dr Ruth De Souza will explore how data is reshaping migration policies globally, particularly in relation to concerns about terrorism, race and irregular migration and how this transforms understandings of migrant and refugee health and wellbeing. 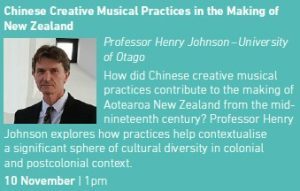 Our Associate Director Professor Henry Johnson, from the Department of Music, Theatre & Performing Arts at the University of Otago, has recently been awarded an external research grant of US$45,000 from the Chiang Ching-kuo Foundation for International Scholarly Exchange for a three-year project entitled ‘Chinese Creative Musical Practices in the Making of New Zealand from the Mid-Nineteenth Century to the 1980s’. This prestigious international award is for innovative research that will study creative musical practices that have often been hidden from mainstream society, especially when compared with other regions of the world, and will help redefine the cultural heritage of Aotearoa New Zealand. Early reports of cultural creativity through music making are found mostly in local newspapers, and while these will form a foundation for historical content analysis, the research will offer a rigorous community-engaged and ethically aware approach in its study of written sources, musical instruments, ritual objects, unpublished archival documents, pictures, photographs, film, museum artefacts, community organizations and oral history. This original project theorises that creative musical practices amongst migrant communities are a reflection of both homeland and adopted home. This premise will help reveal internal modification amongst Chinese communities and the dynamic negotiation with the non-Chinese population where cultural difference was often conspicuous, inequitable and challenging. A comprehension of such practices helps contextualize the making of multiculturalism in New Zealand in colonial and postcolonial context. This research will advance knowledge by producing outputs with significant long-term impact that will contribute to a comprehension of cultural creativity in the making of a nation. The major scholarly outputs for this project will be top-tier refereed journal articles and research presentations, which will uncover and redefine the hidden tangible and intangible creative Chinese cultural heritages that have helped shape New Zealand. How did Chinese creative musical practices contribute to the making of Aotearoa New Zealand from the mid-nineteenth century? On Saturday 10 November 2018 at 1pm our member Professor Henry Johnson will explore this question. The talk is part of the 10 year anniversary celebrations of Dunedin’s Chinese Garden. Those wishing to attend Henry’s talk need to register by emailing: chinesegarden@dcc.govt.nz. Further information about the 10 year anniversary celebrations can be found here. We are deeply saddened to learn of the sudden death in London on 21 September 2018 of Professor Emeritus Eric Richards. Born in 1940 in Denbighshire, Wales, Eric was raised in Shropshire, attended university at Nottingham, and moved in 1963 as a ‘£10 Pom’ to Adelaide. After a stint at Stirling University he was appointed in 1971 to Flinders University. He remained there for the next four decades, during which time he made enormous contributions to the history of the Highland Clearances, migration from Britain and Ireland, and migration to Australia. 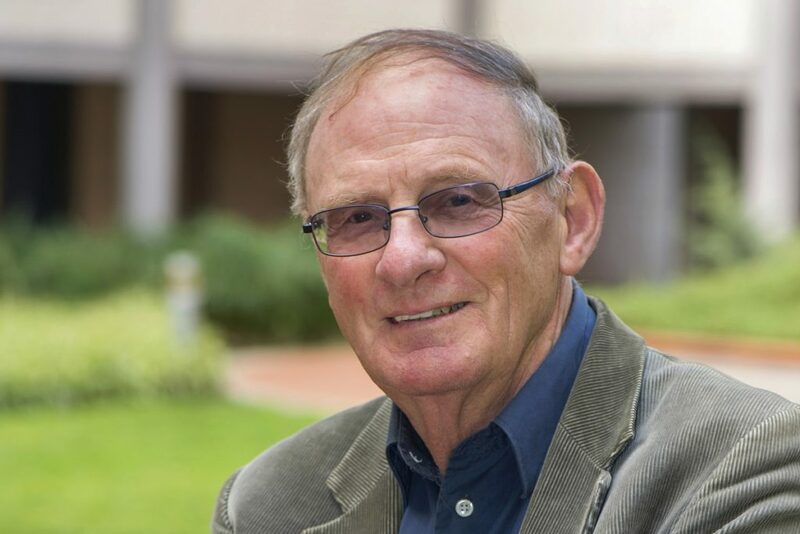 Eric retired from Flinders in 2012, though remained an active writer and lecturer as well as being a keen tennis player and cyclist. Eric also edited the Visible Immigrants series of publications. We were fortunate to have Eric visit Dunedin in January 2010. During his trip he gave a powerful public talk at Otago Settlers Museum about the Highland Clearances (on the anniversary of Robert Burns’ birth), held an erudite seminar on migration to Australia (held on Australia Day), and offered the Immortal Memory at the Dunedin Burns Club dinner. In 2014 Eric was the Carnegie Trust Centenary Professor at the University of the Highlands and Islands. Two of his recorded seminars are available here and here. 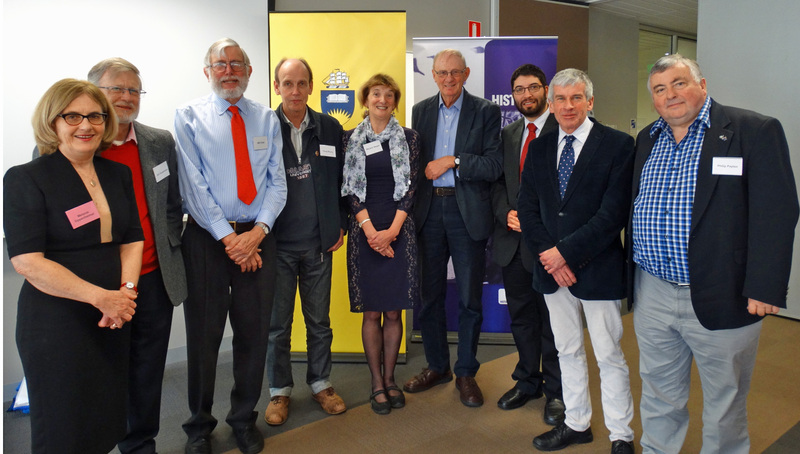 In 2015 Flinders held a seminar in Eric’s honour. The proceedings, published the following year, included a tribute from Professor Philip Payton. It is available here (544KB). A gentle, warm and kind man, Eric is much loved, deeply missed and never forgotten. Our sincere condolences to Ngaire and all Eric’s family, friends, and colleagues. New Zealand was the last place on earth to be colonised by humans, and archaeologists sometimes emphasise this fact by talking about the three million year journey from Africa to Aotearoa. But not only was New Zealand the last place settled by people, that settlement event involved what was probably the longest over-sea journey ever undertaken in the preindustrial age. The closest possible origin point for the first settlers of New Zealand lies about 3,000 kilometres to the north east, a bit further than the distance from London to Ankara, and with nothing in between but water. Given the extraordinary nature of the event, archaeologists have long been interested in understanding Pacific and New Zealand colonisation. Up until the early 1960s archaeologists and historians relied heavily on oral tradition to understand the settlement process. These traditions focused on the arrival of named waka that brought out the founding ancestors of modern tribal groups and confederations, establishing their mana on the new land. The tide turned against the explanatory power of oral tradition from the 1960s as Maori scholars started to critically examine the sources we were using. Two issues were raised that undermined archaeological and historical confidence in traditional sources. First, it was clear that the sources being consulted had been subject to massive levels of reworking by European writers that seriously altered the form and intent of the original texts. Second, from this it became obvious that if modern scholars wanted to use oral tradition, they needed to be able to read Maori, consult the original texts, and apply appropriate, anthropologically informed, textual analysis theory. This inspired a new group of historians who were confident and capable in working with oral tradition such as Anne Salmond and Michael Reilly. Archaeologists got left behind somewhat. As archaeologists turned away from oral tradition they tended to turn away too from notions of agency and the role of individual actors in the colonisation process. Most significantly we lost the concept of migration. Once a key notion in any discussion of New Zealand settlement, for the last 20 years or more ‘migration’ has largely been purged from the archaeological literature dealing with the Polynesian settlement of New Zealand. The three papers offered here are attempts to reposition the significance of oral tradition, and to reintroduce notions of agency into discussions of New Zealand and Pacific colonisation. There are two issues in particular that we are concerned with – globalization and migration. In the Weisler & Walter 2017 paper (1MB) we start before New Zealand was settled and describe the nature of the Polynesian societies in the fourteenth century AD from where the migrants originated. Abandoning a more environmentally or ecologically determined suite of models to explain the settlement of New Zealand, we show that this was a region of Polynesia, where many of the processes that underpin and drive globalisation were incorporated into the regions social fabric. We argue that the colonisation of New Zealand was part of a globalisation process – not a single, decoupled event. In the Walter and Reilly 2018 paper (1.60MB) we revisit oral tradition as a way of understanding colonisation. Using a deep reading of the texts we show that there is a consistent meta-narrative that emphasises individual agency and the role of exceptionally charismatic leaders in driving Polynesian migration. We describe how this notion of deliberate migration is compatible with contemporary archaeological findings. In the Walter et al 2017 paper (1.07MB) we use modern archaeological science combined with genetics and molecular biology to demonstrate that the best explanation for the colonisation of New Zealand is a mass migration early in the fourteenth century AD. We show too how this is compatible with a nuanced reading of oral tradition. Weisler, M.I. and Walter, R. (2017). ‘East Polynesian Connectivity’. In, Hodos, T. (ed.) The Routledge Handbook of Archaeology and Globalization. London, Taylor & Francis Ltd, pp. 369-386. Walter, R. and Reilly, M. (2018). ‘Nga Hekena Waka: Migration and Early Settlement’. In Reilly, M., Duncan, S., Leoni, G., Paterson, L.; Carter, L.; Rastima, M. and Rewi, P. (eds.) Te Koparapara: An Introduction to the Maori World. Auckland, Auckland University Press, pp. 65-85. Walter, R.K., Buckley, H., Jacomb, J., and Matisoo-Smith, E. (2017). Mass Migration and the Polynesian Settlement of New Zealand. Journal of World Prehistory, 30:4, pp. 351-376. During May to August, 2018 I was hosted as a Visiting Scholar at the Centre for Global Migrations at the University of Otago. While there, I was based at the Higher Education Development Centre. During the fellowship, I gave several radio interviews, ran two workshops and gave a public lecture. I also spoke with many in the Otago academic community and outside of it on issues related to refugee resettlement, the role of higher education in responding to their needs, and on the role of the university in general in today’s world. As well as being able to work directly with Dr Vivienne Anderson at HEDC on our research project, it was great to regularly meet with other colleagues at the department and learn more about their research work. I also took the chance to meet with other academics within the University of Otago community and learnt more about how Dunedin as a city, and Otago as an institution, is responding to the so-called refugee ‘crisis’. I found this time useful to critically reflect on my own institution in Bangladesh, both in terms of our curriculum structure and mission statement and also in terms of how it is serving the refugee community specifically and what we can perhaps do better. I am very grateful for the opportunity to visit the University of Otago and look forward to building on the many connections made during my time there. 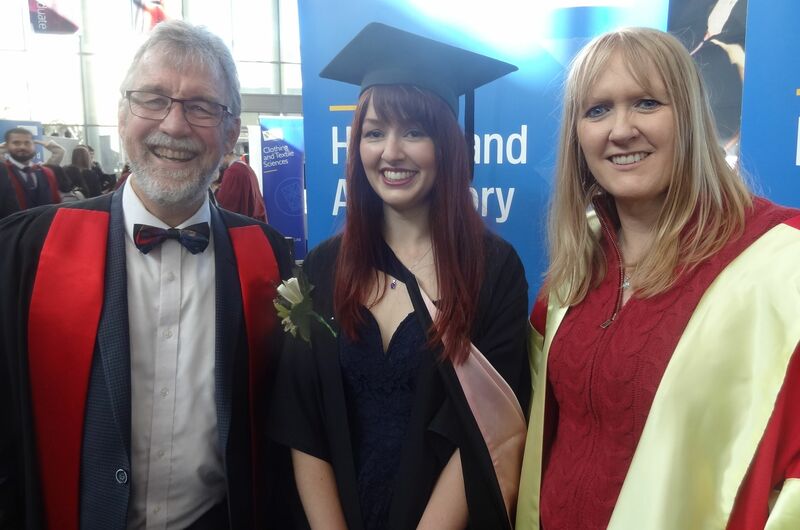 We are delighted that one of our postgraduate members, Peita Ferens-Green, has graduated with a First Class Honours Masters degree. Peita’s thesis, supervised by our director, Professor Angela McCarthy, and History staff member Associate Professor John Stenhouse, examined the working life of Thomas Ferens, a migrant from Durham to early Otago. This thesis is a case study of Thomas Ferens, a Methodist lay preacher from England. Utilising personal testimony, it follows his life in New Zealand from 1848 – 1888, focussing upon his various occupational pursuits to explore how his sense of ‘self’ affected his migrant experience, analysing how he navigated life in the settlement, and how he was influenced by the world around him. Typically, migrant scholars using personal testimony focus on those of a (literate) middle to upper class status. A focus on Ferens, however, provides a working-class perspective. He similarly offers a perspective on Methodists in the Scottish Presbyterian Otago settlement. This work engages with studies of missionaries, religion in New Zealand, intercultural relations and constructs of self/other. It also addresses the impact of runholding and declaration of hundreds in North Otago and the need for personal mobility, both geographical and occupational, in this early period of settlement.